This paper explores the market for indeterminate works of art. Our data set includes 1578 sales of fifteenth and sixteenth-century anonymous Flemish paintings, mainly collected from the Blouin Art Sales Index over the period 1955–2015. After a brief introductory section to the issue of anonymity in early modern art, and the different situations of information failure generated by anonymous paintings, the empirical part examines the supply and demand for paintings by unrecorded artists, using a hedonic pricing model. We find evidence that the degree of specification of the spatio-temporal designations given to the paintings (e.g. Flemish school, sixteenth century) affect prices differently (H1). The more specific the designation is in time and space, the more it tends to make up for the lack of information, and to positively affect the market value of anonymous paintings. When the artist name is missing, we also argue that purchasers pay greater attention to other quality signals. Four other hypotheses, which are expected to influence the buyer’s willingness to pay, are successively tested: H2) the physical condition of the painting; H3) oral or written interventions by an expert; H4) the length of the lot essay; and H5) previous attributions to named artists. The results suggest that most of these variables operate as significant pricing characteristics. We finally compare price indices of named artists, indirect names and spatio-temporal designations. 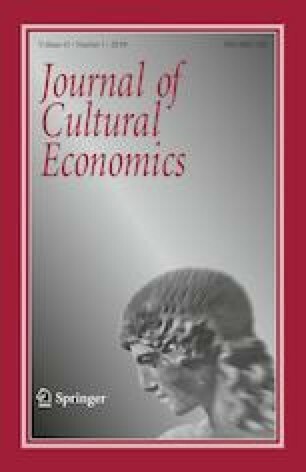 This paper was presented at the 20th International Conference on Cultural Economics (ACEI2018, Melbourne, RMIT University) and rewarded by the President’s Prize. I am grateful to Prof. Kathryn Graddy for making relevant comments on this paper, as well as to Prof. Victor Ginsburgh, Prof. Kim Oosterlinck, Dr. Aleksandra Wisniewska, Prof. Douglas Noonan and two anonymous referees for their relevant suggestions. I also want to thank Profs. Didier Martens and Hans J. Van Miegroet (Duke University, March 2018) for the interesting discussions we had on this topic. This paper has been also discussed during the International Art Market Workshop held at the Université libre de Bruxelles (16 November 2019). Several experts from Sotheby’s and Christie’s, and other international and local salesrooms, have been interviewed in order to face my results with their professional experience. All errors are mine. This study was supported by Fonds De La Recherche Scientifique—FNRS. See Tables 11 and 12. See Tables 13 and 14. Radermecker, A.-S. (2018). De l’usage maladroit de la signature d’artiste dans les études économiques. Koregos. Revue encyclopédique et multimédia des arts, 226. http://www.koregos.org/fr/anne-sophie-radermecker-signature-marche-art/. Accessed May 18, 2018. Reyburn, S. (2014a). For old masters, it’s all about the name. The New York Times. http://www.nytimes.com. Accessed May 28, 2018. Triplett, J. (2004). Handbook on hedonic indexes and quality adjustments in price indexes: Special application to information technology products. OECD Science, Technology and Industry working papers, no. 2004/09, OECD Publishing, Paris. http://dx.doi.org/10.1787/643587187107. Accessed May 23, 2018.